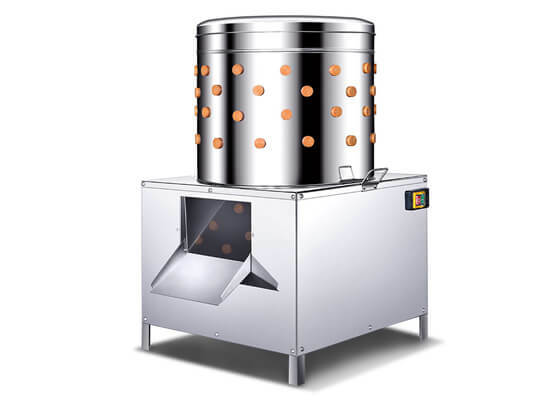 The poultry removal machine can effectively pluck off the feathers of chicken, ducks, gooses, pigeons, quails and other poultry or birds while do not bruise the skin of the poultry. Besides, this machine is able to peel the skin of potatoes, ginger, and other related vegetables. It is extremely time-saving and labor-saving, and the plucking speed is faster than that of 10 persons within the same time. How to Use Amisy Poultry Feather Removal Machine? 1. Scale the chicken to loosen its feathers in hot water about 70-80 degrees before you put it into the plucker. 2. Turn on the plucker, and let the chicken go round and round until all the feathers are plucked off. 3. Turn off the plucker, take out the chicken and clean the plucker with water. 1. Rubber sticks, no damage to the poultry skin. 2. Pluckers with different sizes, 1-5 chickens/ min. 4. Simple structure, easy to operate. 5. If found the dial of the plucker runs slowly, adjust the nut of the machine seat, neither too tight nor too loose.